UPDATE (2/8/14): This article was originally titled "Flappy Bird Is Making $50,000 A Day Off Ripped Art." Given that the word "ripped" can be interpreted as "lifted," I've decided to change the headline for the sake of clarity. Before scrutinizing the two pipes side by side, I believed that Flappy Bird's art was directly taken from Mario—however, when examined, it's clear that Flappy Bird's pipe is a new albeit unoriginal drawing. The similarities are apparent, as I originally noted, but "ripped" may have been too harsh a word. Everybody's talking about Flappy Bird. We've all kind of just accepted it as a mobile phenomenon—the type of "little guy strikes big" story that has endeared millions to the likes of Notch (Minecraft) and Dean Hall (DayZ). In fact, Flappy Bird has gotten so big that its creator, Dong Nguyen, told The Verge he's making $50,000 a day on ad revenue. $50,000 a day! That's $18 million a year, FYI. But people seem to be glossing over one important fact: nothing in Flappy Bird is original. The Verge points out that much of the art is "inspired" by Super Mario Bros., but this game goes beyond inspiration. We're in ripoff territory here. On the left is Flappy Bird; on the right is Super Mario World. 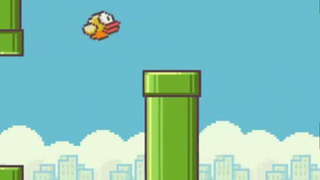 Weird to think that some kids might grow up thinking these are "Flappy Bird pipes." Even the twinkly sound effect when your bird flies between pipes is heavily inspired by Mario's coin-collecting chime, to the point where they sound nearly identical. Let this be a life lesson: if you want to make $50,000 a day, put ripped art in a terrible game. UPDATE, 2/8: The game's creator says he now wants to remove Flappy Bird due to some of the reaction the game has received. When asked if it was because of criticism of the game's art, he said it was not and also said it was not due to any legal issues.